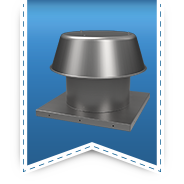 Gravity Vents | S&P Canada Ventilation Products, Inc.
RCXII and RCXII-SF relief or intake ventilators feature low contour spun aluminum hoods for an attractive appearance. They are designed to exhaust or supply air from or to an enclosed area without the need for a power operated fan. Available in two styles, these fans range in sizes from 6 to 36". The RCXII has a curb cap found on most roof ventilators and must be mounted on a roof curb. RCXII-SF has an extra wide, flat base that installs under roof shingles and does not require a roof curb. Both styles come standard with a galvanized birdscreen. RLX Aluminum Louvered Penthouse provides a low silhouette and modern design for fresh air intake, pressure relief and gravity applications. With hundreds of optional lengths and heights available, the RLX is frequently used for enclosing unsightly rooftop equipment. 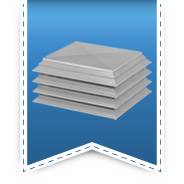 The storm resistant aluminum louver design provides weather integrity when properly sized. Catalogue capacity ranges from 395 to 69,500 CFM with much greater ranges available in custom sizes. Companion, louvered fan Model LSF offers continuity in rooftop equipment designs. 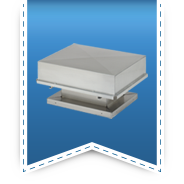 BGH Gravity Ventilators offer a modern low silhouette design that blend with roof lines and other equipment. Designed for maximum airflow passage and weathertight integrity, BGH comes in either intake or relief models with aluminum or galvanized finishes. An extensive range of sizes are offered with many standard and optional features. Exhaust models have a 1:1 ratio of hood perimeter opening to throat area and supply models incorporate a 2:1 ratio.